Sarah graduated from Northeastern University with her Doctorate of Physical Therapy. 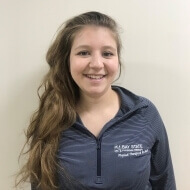 She has experience working with a variety of orthopedic conditions and developed her passion for an orthopedic population while completing her clinical rotation at Bay State Physical Therapy in Brockton. Sarah also gained experience working with a pediatric population at Boston Children’s Hospital and enjoys developing fun and creative treatments for pediatric patients. In her free time, Sarah enjoys spending time with her family in Upstate New York. She enjoys going on adventures, such as hiking, snowboarding, and camping. Sarah is also an enthusiast for sports, such as basketball, tennis, and football.